Hello again - 3 weeks after I promised to wrap up this tale. I had a few things on my plate to finish up and more than enough work to keep me from posting. Without further adieu ado (thanks Shelley)...here goes part 2. Expect a long read with plenty of pictures. Pour yourself a nice beverage, sit back, and read! I left off where I boarded the float pulled by a jet ski pulled and prepared myself to drop into the East River. The swim began unlike any other marathon swim - from the water. I was just dropped off the float, a horn sounded, and I was off! For the first time, I felt a little unprepared. Yes, even after two consecutive long marathon swims, anyone can feel unprepared. I wasn't in my normal frame of mind. The swim started abruptly and I never had the chance to get my mind focused nor my gear sorted out. It was a bit chaotic - all due to my own poor planning and preparation. Fortunately, I knew I had a first-rate crew and they would sort things out. 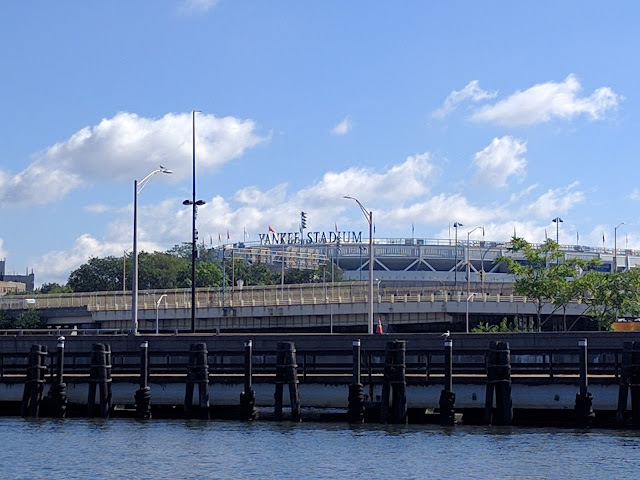 So I swam up the East River for a few strokes, peering to my right and then my left to see where I was in relation to where I grew up (89th & Madison). It was a rather odd feeling starting right next to the Asphalt Green - a place I knew pretty well during my degenerate youthful days. The East River quickly veered off to my right while I stayed left to begin my northward push through the Harlem River. Neither body of water was terribly clean but they both struck me as cleaner than I remembered. Of course, that thought was a necessary cognitive distortion to keep me from throwing up at the mere thought of dead things and such thrown into this water. So, I swam and swam hard to get through it. I had several thoughts during this section. First, I wanted to really keep my stroke strong and my kicking pace high. Why? I learned from both the Catalina and English Channels that I had the stamina to kick for at least 8-10 hours. Knowing that or at least believing that helped me feel confident that kicking would really speed up this leg of the swim. Also, I was constantly aware - perhaps too much so - of the importance of making the landmarks at the appropriate times. There was no room for delays. Missing these landmarks or at least missing the times estimated for being around them might result in an abandoned swim due to the strong currents. The currents around New York City are notoriously treacherous. At the start, I knew I would be pushed up the East River by almost 4 knots of current and that push would ease off as I approached the Hudson River. By my own calculations, I had to stay on track and keep my pace up if I were to have a good chance of finishing the swim with all favorable currents. So that thought stuck with me for the entire Harlem River. I was in a good mood and felt extremely confident about the swim. Despite the weather forecast of a hot and windless day, I focused on the positives. My kick felt strong, my body recovered from the previous swims, and my pace was spot on for a strong swim. I was flying up the river. As I passed by certain places I noted on our boat trip to the start, I felt more confident that I was really moving quickly around the island. Things were just progressing perfectly. About 30 minutes before we hit the confluence of the Harlem and Hudson Rivers (just past Sputen Duyvill Creek), I passed by my friend Tracy Clark. We didn't get a chance to say hi but I did wave to her crew - Roger Finch and Jim Clifford (two extremely accomplished marathon swimmers). They were incredibly supportive as I know Tracy would have been had we had the opportunity to chat. I was bummed to see her before the finish because I really looked forward to crossing the finish line together. We both were completing our Triple Crowns and I figured it would have been a wonderful way to cap off the summer. Also, Tracy is a phenomenal person who supports tons of swimmers by crewing, teaching, and cajoling them to do extraordinary feats. She was one of the first people I met when I went to Dover last year and we immediately connected on Facebook and exchanged congratulations for each and every accomplishment. Tracy is a dear and I really wished we had the chance to finish together. Alas, it didn't seem possible at the moment - forge on ahead is where my mind was after that brief bit. Before I mention much about the Hudson River leg, I feel compelled to talk a bit about my swim during up the Harlem in a wee more detail. For every stroke up the river, I felt like I was able to get closer and closer to escaping the horrendous portion of the swim. The Harlem River was dirty for sure - as evidenced by the occasional "NY Whitefish" (aka a used condom) and random bits of toilet paper here and there - and I wanted out as soon as possible. It seemed as if this leg lasted forever. I didn't take much notice of the sights around me like Yankee Stadium (to my right) or the Columbia crew house (to my left) while swimming. Instead, I took the opportunity at every bridge to flip over on my back and float under. It just seemed fitting for this swim. My last marathon swim for the summer, the capstone to my Triple Crown, and the first (and most likely last) time I saw these bridges from this perspective. I wanted to soak it all in. So, I did. My way of soaking it in was to literally soak in the water and let the current take me past each bridge. I relished these moments. As I passed Spuyten Duyvill Creek and crossed below the railroad bridge (unnamed by Google Maps), I felt the currents tossing me from side to side and the extreme warmth of the water. I swear this water was not a degree cooler than our hot tub at GMU. The water seemed cleaner but far warmer than the Harlem River. I was not happy about the changes in water temperature but I figured the Hudson would cool off as I swam toward the center and took advantage of the strong, favorable currents. Well, that "cooler" water never happened. 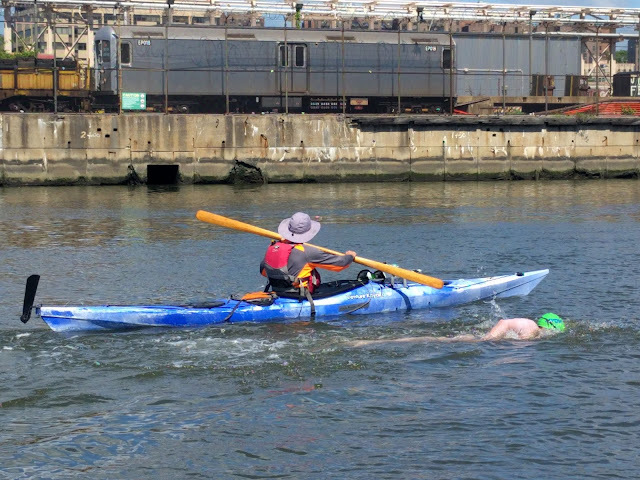 The water stayed hot and unrefreshing the entire swim down the Hudson. The Hudson leg was the foggiest part of the swim for me. I could feel myself overheating and my legs began cramping after I floated under the George Washington Bridge. All that kicking up the Harlem River paid off in speed but I think it really cost me physically. I could no longer kick without causing a cramp in my calf or in my quads. Those cramps also shifted my focus from my stroke to my deteriorating condition. I was not happy and tried to busy myself with all sorts of thoughts - none really helped. All I could do was watch the landscape go by and try to recall the times I was in that part of the city. In some instances, the memories were a nice distraction but mostly the effort resulted in me feeling like I wasn't making very good progress. One thought I had was enjoying a cold beer right after the finish. In fact, I could not extinguish this thought and then started worrying (yes, worrying) that the beer might be gone or warm when I finished. I yelled to Brendan to make sure we had a few beers at the finish and that they were "on ice." He said he was on it and I knew he understood the gravity of that request. I still didn't think I was making good progress but the anticipation of a cold Peroni at the finish made my current, miserable state more tolerable. 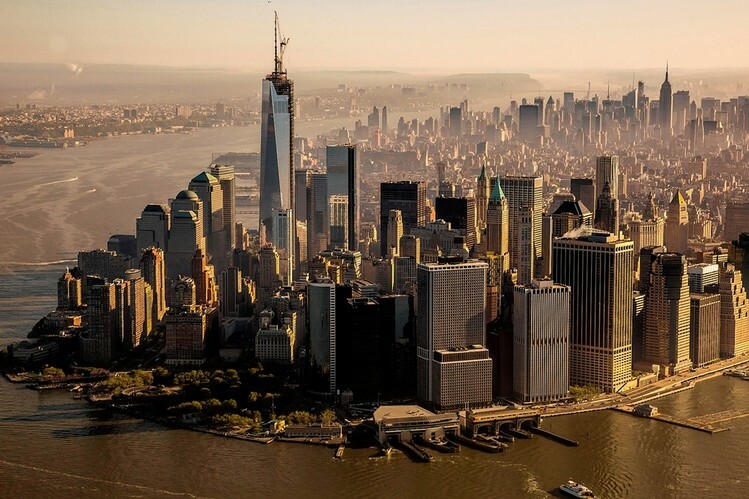 In truth, I was flying down the Hudson with a huge current pushing me past the entire city. In no time - well, actually in about a few hours - I found myself around the Empire State Building and recognized a ton of other buildings - many I had been in over the past few decades. It was about this time that things started to slow down. I was able to make out the new Freedom Tower to my left and a bit ahead. That building view stayed with me for what seemed like an eternity. I kept reassuring myself that the view of the ever-present building was a visual artifact of me simply changing the viewing angle with my head or eyes. Unfortunately, no self-soothing or self-assuring helped me as I continued to battle the leg cramps that now crept up to my lower back. Just as the buildings gave way to the park greens of the Battery, I started to feel some relief. That relief didn't come from my cramps easing up - quite the contrary. I felt relieved that I was approaching the last milestone to ensure favorable currents. The Battery was that last milestone before the finish. I made it! 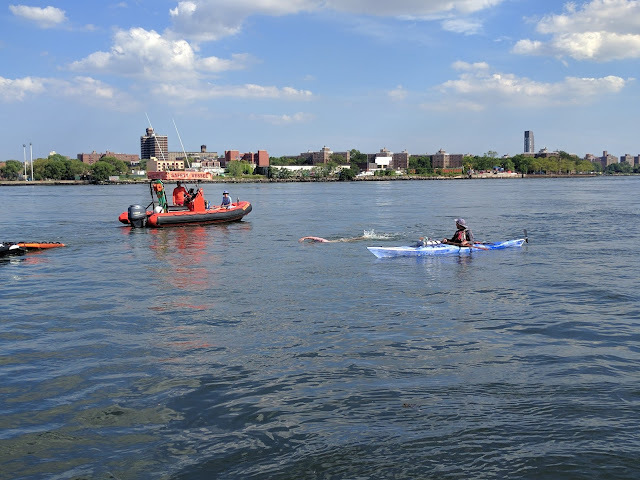 I figured the rounding would be quick and I would re-enter the East River and get pushed up to the finish. I wasn't wrong about that last bit but the process unfolded way slower than I anticipated. Rounding the Battery was way more frenetic than I ever imagined. Ferry traffic, standing waves, and commotion distracted me from ever thinking about my stroke. Combine all those distractions with the now pretty severe leg cramps made the celebration of the rounding much less...well...celebratory. I could barely muster the enthusiasm to enjoy the rounding and sneak a peek at the Statue of Liberty. In fact, I never saw it. I was too preoccupied with my current state and the frenzy that seemed to unfold around the ferries to even look. Rounding The Battery was less memorable than I would have liked but I got through that part. The waves were strange and the water finally tasted salty - a welcomed change from the hot Hudson River. Those memories were about all I had of that part; shame I couldn't enjoy it more. My kayaker (Michael) guided me around, through, about, and the ferries without a hitch. He just told me to follow him and follow him I did. I had no clue what was really unfolding; I just knew that there was a ton of chatter among my pilot boat, him, and the race directors. I tried to the best of my ability to focus on my stroke but it was not really working to my advantage. Every time I focused on my stroke, I started to kick just a little and then all the muscles in my legs started tightening up. I was in a sorry state but quite pleased to be out of the Hudson and onto the final leg of this swim. Entering into the East River proper, I expected to fly up to the United Nations Building in no time. Well, that didn't happen as expected. First the Brooklyn Bridge went by and I thought about my cousin Ed and his wife Maureen. They would have loved the view - especially Maureen. 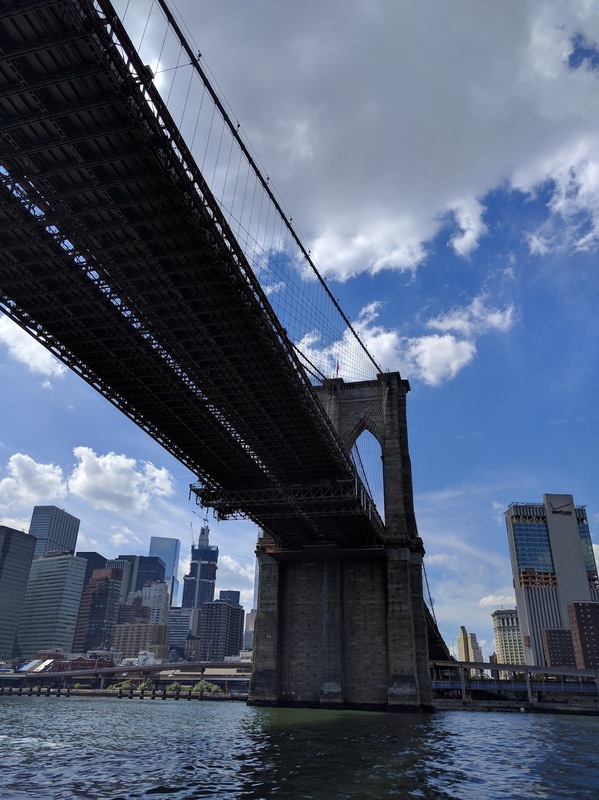 I would not recommend hopping in the water just for the view but it was quite remarkable to see that bridge from below. Once past that bridge, the Manhattan Bridge came in what seemed like an hour. Boy was it slow going up the river. I don't know if I had a favorable current but as far as progress up the island, I was not feeling that positive. I couldn't help notice that the same buildings were in view for what seemed like an hour. 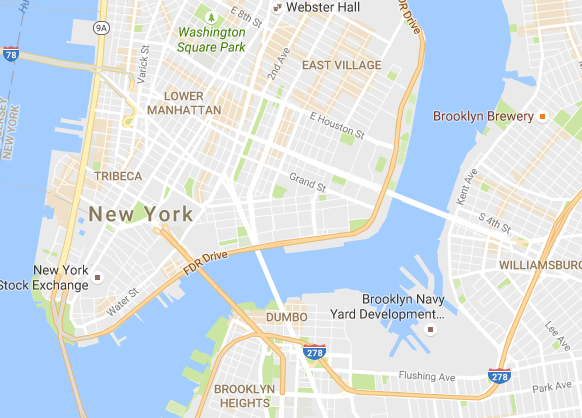 Just as I started getting down about the ordeal and thinking about the end (or rather how long I could hold on), I remembered that this area of Manhattan pointed more East than North so I should not expect to move that quickly to the North. That little mental note made the going much more relaxing. Well, relaxing may not be the right word but more relaxed works. The East River and the eastern swing of the river before heading North again. I then started thinking about the upcoming bridges. In fact, the pilot or someone asked me which bridge I was under and I could barely recall any bridge that I had just swum under in the past hour. I was cooked or perhaps boiled at this point and my brain was not doing too well. He, of course, was referring to the Williamsburg Bridge - one that I had been over many times but somehow couldn't even make out from my angle. It was time to finish this swim and I was bound and determined to get it over. In what seemed like an eternity, I swam up the East River and soon noticed I had company. A few other swimmers converged with me and we were all moving at about the same rate. Well, the truth of the matter was that I felt like I was sitting still and they were catching me and about to pass me as if I were a beer can floating up the river. I have no stake in time nor do I care much about competition in these events. What motivates me is the adventure. I did not think for a second about place or time; I just wanted to finish and the sooner I finished the better. So, I started to kick again and this time my legs were not cramping up like they did in the Hudson. I guess the cooler waters in the East River helped my legs recover a bit and I was able to kick gently without them fully seizing up. Just as I started to kick, I finally saw the United Nations Building and realized I only needed to pass by Roosevelt Island (a place I worked for several summers when in high school) and then finish at 92nd street. I knew I could make it and I pushed hard to get this swim over so I could enjoy that cold beer that Brendan assured me would be waiting at the finish. Michael told me some plan to stay to one side and I told him that I didn't need to know the rationale - I would follow him wherever he wanted me to swim. 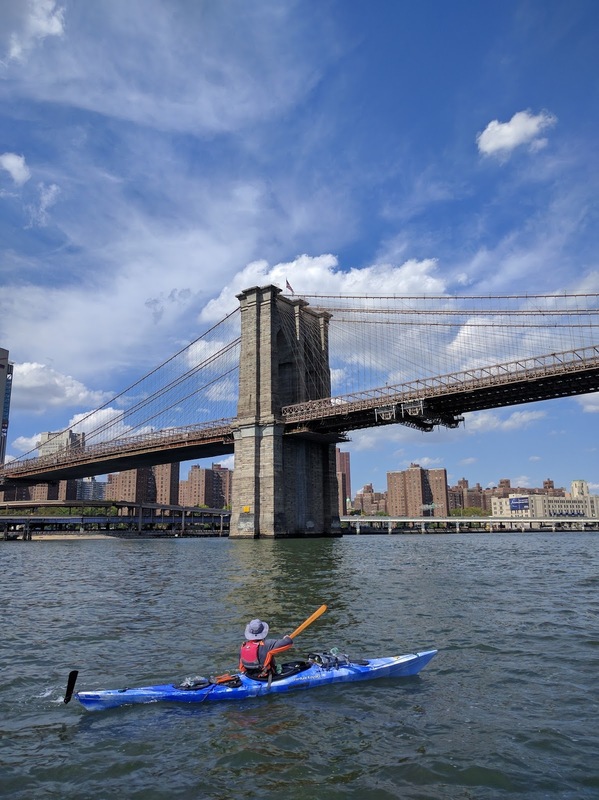 I complied and he set me up for an awesome ride past Roosevelt Island and under the 59th Street Bridge or Queensboro Bridge (now named after Ed Koch - go figure). Just as I approached Roosevelt Island, my legs started to cramp again and now the cramps radiated all the way up my back. I was desperate for something but what that "something" was I had no clue. Finally, I ask Michael if he had any Coke or Gatorade. I knew my electrolyte balance was shot and I really needed a final boost to carry me the next mile and a half to the finish (20 NYC blocks North-South make up a mile and I had 30 to go from the bridge). Michael didn't have anything but the skipper of my pilot boat gave me his own Gatorade. It tasted like pure heaven. I could not believe how refreshing it was and how quickly my leg cramps went away after just that cold 12-18 ounces of fluid. Clearly, I was dehydrated and in need of some salts. The fresh water and heat changed the swim entirely for me and I was not prepared well for those conditions. At this point though, I was flying and I knew it. The currents were so strong under the bridge that as I laid on my back in spread-eagle fashion, I couldn't help but notice the land whipping by me at about 10 miles per hour. Yes, the currents had to be about 8 knots. I wasn't swimming and I was cruising toward the finish. It was great. Later, Kat told me that Michael was not even paddling and he was going about 8 knots up the river - further confirmation of the water's speed. All the swimmers converged at this point and we all drifted toward Mill Rock (aka the finish). I saw Gracie Mansion and the park around it and knew the end was near. The thought occurred to me that I was about to complete the Triple Crown but I shifted my focus on getting to the finish. There would be plenty of time to celebrate but not now. Just a few hours earlier, I was wondering if I would even be able to finish given my sorry physical state. As I passed that last landmark and could make out the Asphalt Green, my only thought was....BEER. I was so thirsty. The Gatorade was refreshing but it made me thirst for more. The finish was rather uneventful but glorious at the same time. I took a few strokes after thinking about the beer I would have in the boat back to the Marina and then, all of a sudden, an air horn signaled the end. I was done. I was literally done. Cooked, wasted, overheated, hyperthermic, dehydrated, and yet elated. All of the hard work I put in throughout the previous year paid off. I had an awesome team who supported me for this swim and for all the previous swims. Despite my reservations about swimming around Manhattan, I did it. All was good. Now, it was time for a beer. A HUGE THANKS TO MY CREW!!! From L to R: Brendan "da Coopstah" Cooperkawa, me (aka the Walrus), Kat (no nicknames...just Kat), Cheryl Ward (the best coach ever), and Fred Zamon - the toughest dude I know. My crew. Simply the best. Words of appreciation do little to express how honored I was to accomplish this even with them. A special thanks goes to my lovely wife Kat who endured rocking boats, heat, cold, sleep deprivation, and marginal food to support me during these events. We did it Kat! I love you so. The crew managed to stay cool enough to support me throughout the entire day. I thank them for their sacrifice and plan to make it up to them in some form or another. Every swim is different. 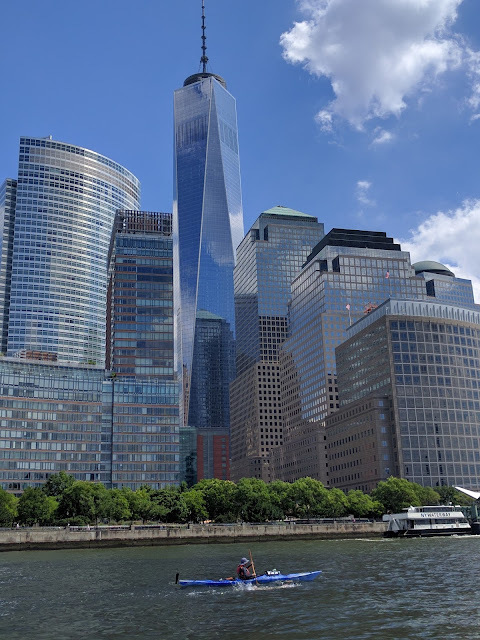 Just because I was able to endure the colder waters in the Catalina and English Channels, I was barely able to endure the hotter waters around NYC. My feeding schedule and feeds themselves were not tailored to these new conditions and because of that little oversight, I was ill-prepared for the swim. Next time, I will prepare for each swim more carefully and never overlook any potential differences. Ignorance is bliss. I prefer not to know where I am during a swim. Well, I like to know and be fully aware that I am in a body of water that I can name and where I am approximately on earth but I don't want to know how far I am along the route. That information distracts me from what makes these swims so enjoyable - focusing on my stroke. I can focus for hours but as soon as I get outside information such as progress (or lack thereof), I no longer focus on what matters most and the time moves by at a slower pace. By focusing and staying focused on the task at hand, time no longer becomes relevant and the task seems easier. Marathon swimming is a team event. Nothing I did during this Triple Crown would have been possible without a dedicated crew. My wife, Kat, set aside her own athletic goals (she is an extremely competitive triathlete) to help me achieve mine. She helped me think through the process and refine it as we progressed through each swim. Kat was the only person to accompany me on all three swims and I realize she was instrumental if not imperative to our success. The 20 Bridges Swim was a team effort that was bolstered by additional help. Despite the fact that my son Patrick was not available for this swim, he helped in other ways. Patrick came along for the Catalina and English Channel swims and he sacrificed a few weeks to help me. He was training for football, swimming and running all summer. Those trips to California and Dover sidelined him from any organized practices and I realize his sacrifice may affect all his sports. I plan to support him in other ways to ensure he gets back on track. During this swim, I had my good pal Brendan who I knew would be game for the ride and who I had all the faith in the world to keep me motivated, positive, and focused. He never let me down. Brendan also left his family to hang out with us for several days. I realize he would sacrifice most anything for me if I were in need and I appreciate it. Our post-swim celebration made the sacrifice even more worthwhile. Right Coop? Next, Cheryl Ward sacrificed her weekend to come to NYC and lend a hand. She is my coach and more than anything else, she is a tireless cheerleader who offers me whatever she thinks I need at the time she thinks I need it. Thanks Cheryl for putting up with me and my antics. 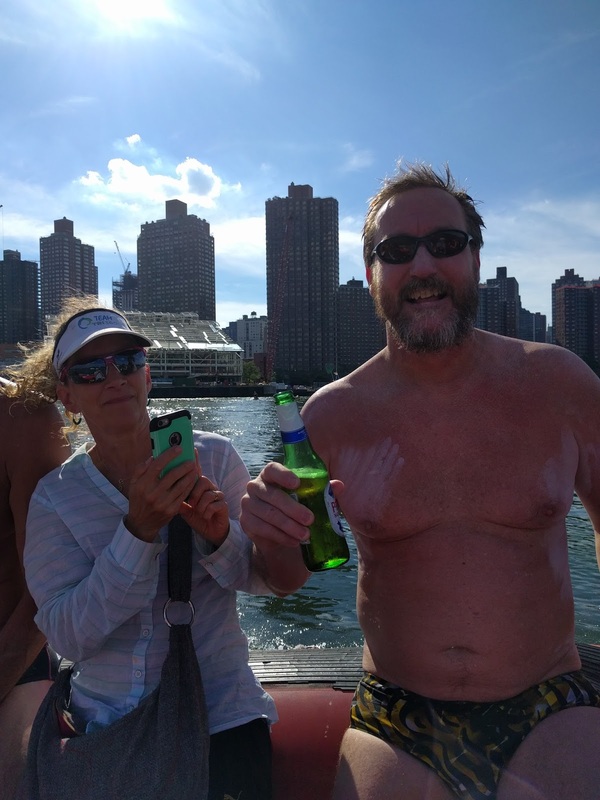 Last but hardly least, Fred Zamon made equal sacrifices to the rest by coming up to New York right before the US Masters Swimming Long Course Championship meet in Portland, OR. He was on a boat for an entire day, braving the heat with the rest of the crew, and observing my swim to make it "official." Fred was a trooper who thought about every little detail and kept us all in check. Thanks to these folks, the 20 Bridges Marathon swim was a success. I hope it was a memorable experience for them. Thanks for staying interested and reading my blog. I really enjoy writing about these adventures for you and reliving them via words and pictures. If you have any questions about the experiences, please feel free to comment on the blog or send me a direct note via Facebook. Many people asked me afterwards..."so, what is next?" Well, I have an answer to that question but I will post in about a week what my plans are for 2016-2018. I have a few adventures in the works right now. My immediate focus, however, is to lose weight. As of today (September 13th, 2016), I weigh 191 lbs or 86.6 kg (down 8 lbs or 3.6 kg from when I returned from NYC). Yes, I almost eclipsed 200 lbs or 91 kg during this Triple Crown. My aim....170 lbs or 77 kg by November 1st. Wish me luck. Hope to see you all soon.